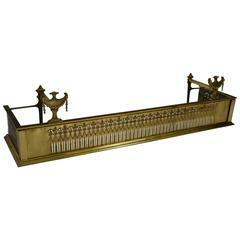 Superb antique English 19th century Georgian style pierced brass fireplace fender with rope motif; exceptionally detailed piercing overall. 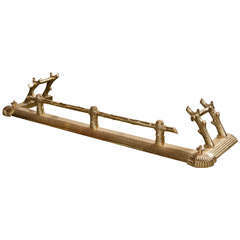 Fine antique English superbly pierced brass fireplace fender with handsome lion's paw cast brass feet. Please note exceptional piercing overall. 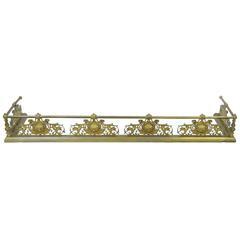 Exquisite antique English pierced brass George III fireplace fender; superb pierced design; cast feet and original steel pan. 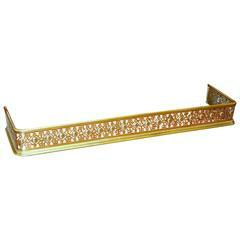 Fine antique English pierced brass fireplace fender beautifully hand-pierced with applied brass discs. A rare English brass fireplace fender in a twig or branch motif from the mid-19th century. Late 19th century English brass fender with branch motif. 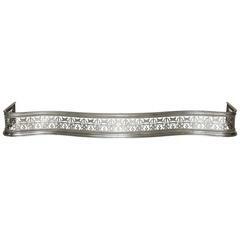 Measures: 8.5” H x 57.5” W x 15” D.